Signature Flavors - We are best esters granola entrusted towards serving to our client with the healthy breakfast with granola and best gluten free snacks to buy which are best for the health point of view. Ester’s story started in the country side along the Mediterranean shore. As a young girl, she spent most of her time in the kitchen watching her grandmother cook with farm fresh ingredients straight from their farmland. Growing up, she became more and more curious about the culinary world which opened up the door to creating her own recipes and working in the food industry. Ester traveled from the far east to the far west tasting the food of the world from classic european cuisine, to the exotic Thai kitchen. Before the calendar changed to the new millennium, she arrived to the United States. Dreaming of one day owning her own food business, Ester began working retail jobs saving up to one day follow her dream. Throughout the years in the U.S. she made food from her childhood, her travels, and began creating new recipes, one of which was her signature original granola. 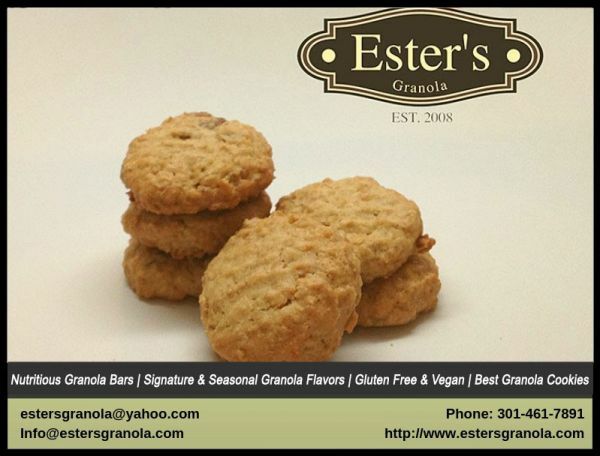 The granola became a hit among her family and friends and after almost a decade of working retail, she followed her dream and started Esters Granola. Ester now resides in Maryland with her husband, but her home overseas will always have a special place in her heart.